No-Knead Focaccia Bread ( Peasant Bread). This focaccia bread recipe is so easy you will make it every chance you get! Grease and set aside a large 9x13 glass pan ( I use my 933 lasagna pan). You can use metal but glass or ceramic seem to work the best. Dissolve yeast into 1 cup of warm water, add sugar and make sure it bubbles. Add the yeast mixture and remaining water; stir until combined. Cover and let rise in a warm place until doubled, about 1 hour. Punch the dough down. Spread out the dough in the bottom of the pan with your fingers until the dough reaches all four corners and fits the pan.Try not to rip the dough while doing this. 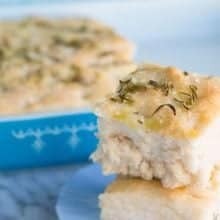 Poke quite a few dimples into the top of the bread with your fingers or the end of a wooden spoon, then drizzle with the olive oil, Sprinkle with the rosemary and sea salt. Let rise for another 20 minutes or so, until the bread gets some height again. Bake at 350° for 30-40 minutes, until golden brown on top and baked through.